Fully renovated inside & out, new kitchen, bathroom, paint, carpets, new bifolds leading onto great entertaining deck at back and lovely ocean views to enjoy at the front of the house. Manyana beach house is about 100 metres from Manyana Beach and has great views along the beach to Green Island and out to sea. Check out Green Island surf from the balcony. It offers a delightful environment where you can relax and enjoy beautiful Manyana Beach, other nearby beaches and aquatic attractions. Around 2 1/2 hours from Sydney or Canberra, It has a modern but welcoming style, newly appointed kitchen & bathroom, front & rear decks & and is fully furnished including BBQ. There are 4 bedrooms (three with queensize beds and one room with 2 king single bunk beds (ie 4 beds for children). There is a cleaning fee of $70 per visit. Please note the property has one bathroom and whilst dogs are welcome, the property is not fenced. One of the things we love about the property are the views, the cottage feel of the weatherboard house and the short walk to the beach. STRICT MAXIMUM 6 ADULTS. Manyana is off the main highway but is close to all the South Coast has to offer - myriad beaches; great surfing especially around Green Island; fishing and water sports in Lake Conjola, Berringer Lake and Sussex Inlet; the untouched beauty of Jervis Bay; and the historic towns of Milton, Berry Nowra and Ulladulla and surrounds. For the energetic, Pigeon House Mountain and surrounding national parks provide great bushwalks. 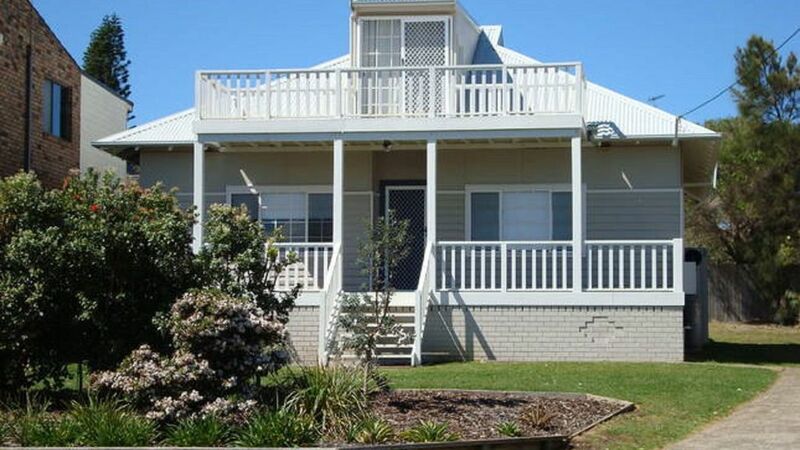 Manyana Beach House has been in my family since 1995. After travelling to Manyana and Bendalong for a few years and realizing how unique and special it was, I bought the house at 24 The Rampart when Manyana was not well known or frequented by many people. The house was one of the first houses in The Rampart, travelling by road from Nowra where it had been a naval house. It has been renovated in a simple beach style to try and keep the feel of the old beach house, but also provide a clean and comfortable place to stay. It has a great proximity to the beach and wonderful views. I hope you enjoy your time and stay. When I first saw Manyana beach house I fell in love with it. It was green and golden at the time and very run down. Underneath, there was a rustic and authentic weatherboard beach shack that was different to the other houses there. I loved the old character of the house. The original doors and the charm of the old weatherboard cottage feel. It reminded me of my childhood and the way a beach house used to be. Over the years it has been lovingly restored to make it a comfortable place to hang out and relax with friends and family. The house is also close enough for the kids to carry their stuff back from the beach! - and also nip home for lunch out of the sun when the days are hot. The views from the house are lovely and you can hear the sound of the sea as you fall asleep - for me that is a beautiful sound. For keen surfers you can see Green Island from the deck and check out the surf. We loved our stay here. The house was comfortable, well-equipped and a very short stroll to the beach. The beach is spectacular and there is so much to see and do in the area. We would highly recommend staying here! Very large & cozy property with a true feeling of tranquility. I will definitely visit again. I loved our stay at manyana beach house. It perfectly matched the description and was in a perfect location. The house was really tidy and clean and the rooms were very cosy. The kitchen had a big fridge and we were able to cook some lovely family meals using all the kitchen equipment they provided. We had a lovely time. This is a lovely property. There's loads of space and everything is comfortable and perfectly suited to a beach holiday. It's an especially nice place for kids to stay, with a relaxed interior and a garden to play in. The house is walking distance to the beach, and filled with interesting artwork. The kitchen is an enjoyable inevitable for a couple of families to use together. We really enjoyed this beach house. We had a great time at this house. splendid views to green island and the place is well-appointed with a beach house feel.